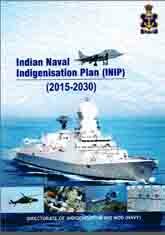 Mr Manohar Parrikar, Hon'ble Raksha Mantri released a 15 year Indian Naval Indigenisation Plan (INIP 2015-30) on 16 July, 2015 during a CII-Indian Navy Seminar in New Delhi. This document supersedes the Indigenisation Plan published in 2008 for the period 2008-2022. This document is aimed to enable indigenous development of equipment and systems over the next 15 years. It attempts to formulate the requirements of the Indian Navy and lists out the equipment which can be taken up for indigenisation in the coming years. It is expected that release of this plan would further synergise the Indian Navy’s relationship with the industry and encourage all sectors of industry to come forward and participate in indigenous development of weapons, sensors and other high end equipment for the Indian Navy, thereby making the nation self-reliant in this vital domain of defence technology. The document is currently hosted on Indian Navy's website. Please click here for more details.